The country is in need of an agricultural commodity exchange suited to Myanmar, said Ye Min Aung, Vice-President of the Union of Myanmar Federation of Chambers of Commerce and Industry (UMFCCI) at a knowledge sharing seminar titled “Agri-commodity exchange” Park Royal Hotel in Nay Pyi Taw on February 19. The Yangon Government will seek harsher penalties for reckless drivers, especially those engaged in illegal racing, Daw Nilar Kyaw, minister for Electricity, Industrial, Transport and Communication, told parliament on Tuesday. Market outlook has been generally positive, despite some setbacks. 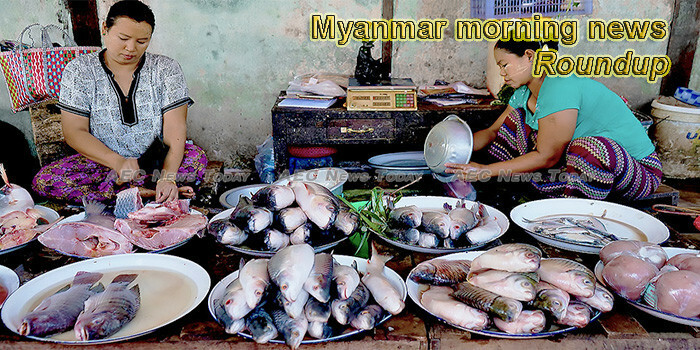 The Myanmar government is taking steps to create a more conducive business environment and to attract further investments into the country. A total of 40 companies from seven countries will display their products in Myanmar International Agricultural Machinery Exhibition 2019, which will be held at the Tatmadaw exhibition hall from March 1 to 3, organized by Myanmar Paddy Producers Association, according to a pre-press conference held at Union of Myanmar Federation of Chambers of Commerce and Industry (UMFCCI) on February 19. MYANMAR set up a committee to discuss reforming the country’s military-drafted constitution on Tuesday, pitting Aung San Suu Kyi’s civilian government openly against the powerful armed forces for the first time over the incendiary issue. As civilizations developed, there was a greater need for water supply, irrigation, flood control, navigation, water quality, sediment control and energy. Located in the northwest of Myanmar, the 13907-squaremile Chin State is decorated with rhododendrons, cherries and various species of orchids and bluish mountains and ranges, almost touching the grey and white clouds, floating high in sky. Chinese State Councilor and Foreign Minister Wang Yi Tuesday highlighted the importance of border security in promoting the economic development of border areas during his visit to the China-Myanmar border in China’s southwest Yunnan Province. The Myanmar military on Tuesday denied an accusation by the Arakan Army that it has been using passenger buses and cars to transport its troops in western Myanmar’s Rakhine state, where the two forces are fighting each other, RFA reported. Mobs of stick-wielding church-goers in Myanmar’s northeast used to descend on dealers and addicts in a desperate effort to save their communities from a meth-induced health crisis sweeping the country. Will Myanmar’s Northern Alliance Join the Peace Process? As of February 2019, Myanmar’s Northern Alliance (NA) is a key player in the country’s armed conflicts. The 11th Yangon Photo Festival (YPF) started on Monday with photographers from Myanmar and around the world showcasing more than 200 photos and short photo documentaries under the theme of environmental issues. Half of the works displayed are by artists from Kayah, Chin and Rakhine states. Thirty-eight staff members from the Ministry of Information learnt how to conduct surveys to collect views and opinions from the public about public services provided by the State-run media. The government will conduct a campaign in Mandalay city markets to try to raise public awareness about the trade in endangered animals, said Forest Security Police Captain Min Htike Kyaw. The government evinced high hopes for a rebound in foreign investment at a recent event in Nay Pyi Taw but its expectations are not shared by many in the private sector. The precisely named Furniture Fair event held at Tatmadaw Hall on February 14 to 17, drew the participation of many topnotch furniture makers and interior decoration companies in the country to set up their booths for the 4-day fair. The 9th Traditional Medicine Research Congress opened in Mandalay yesterday with an opening address by Union Minister for Health and Sports Dr Myint Htwe. Despite problems, women’s empowerment and corporate governance in Myanmar is set to advance under Ma Cherry Trivedi through the organisation she heads, the Myanmar Institute of Directors. President U Win Myint and First Lady Daw Cho Cho attended the ceremony to celebrate the 71st Anniversary of Chin National Day at Vum Thu Maung sports grounds in Haka, Chin State yesterday.